It’s not too late to celebrate Valentine’s Day and give the most important gift ever—the gift of a healthy heart. Cardiovascular disease is the leading cause of death in men and women, which is why February has been named American Heart Month. 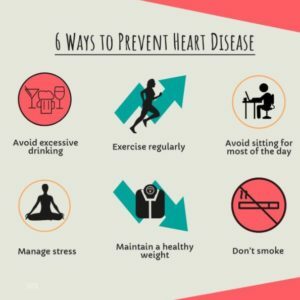 Cardiovascular disease, also known as heart disease, is the overarching term used to describe disorders that affect the function of the heart and blood vessels. Atherosclerosis, one of the most common forms of cardiovascular disease, is a condition that develops when plaque builds up in the walls of the arteries causing them to narrow and restrict blood flow. In severe cases, this can lead to a blood clot which can cause a heart attack or stroke. While some forms of cardiovascular disease aren’t preventable, maintaining a healthy lifestyle can help avert many other forms of the disease—including atherosclerosis. Check out the infographic below for some fast facts about cardiovascular disease and tips for keeping your heart healthy.